Modern alternative to the Clemco style RMS remote valve, and already much preferred by many seasoned blasters. 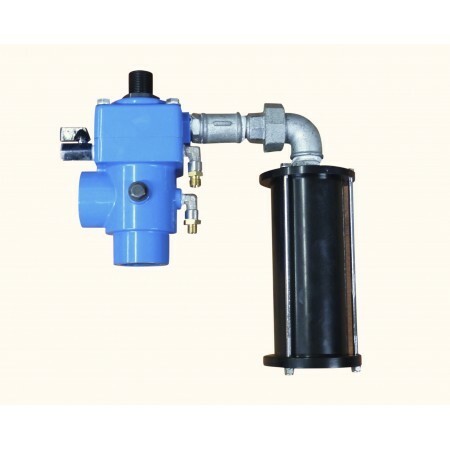 The Panblast Uniflo is an air operated combined inlet/outlet valve which controls the flow of air to the deadman handle and the blast pot, allowing for the complete one man operation of the blast pot. The main advantages over the 'old school' remote valves are its simplicity & very easy maintenance which can be carried out on-site with the valve body still attached to the blast pot .... just 4 hex. bolts to undo.... no fumbling around with 8 easily rounded allen head bolts ! Easy to fit to your existing blast pot. Comes complete with silencer, and remote line outlets. Very reliable. We fit them as standard equipment on all our blast pots. Requires minimum 90cfm to operate.